There are a number of magnificent beaches on the doorstep to choose from. The closest ones are Magilligan Point, Benone Beach leading to Downhill strand. Further along the coast are Castlerock beach, Portstewart Strand, Portrush West bay and East Strand and Portrush Whiterocks beach. This is the nearest crossing point to Donegal in the Irish Republic. It is is a mere 1.6km between Magilligan Point and Greencastle which is a small fishing village on the other side. A continuous ferry service inaugurated in 2002 takes cars and passengers across from either side every 20 mins. The crossing takes about 10mins and saves almost 50miles of driving. No reservation required. Tickets are issued on board. Sailings are available all year round. Wheelchair access via ramp. There is a Martello tower at Magilligan Point, built in 1812 during the Napoleonic wars. It is one of about 50 built around the Irish coast by the English to defend the islands against invasion from France It is genuinely round with walls over 9ft thick mounting two 24 powder (11kg) guns. It has been beautifully restored but is normally locked. Group tours are bookable by arrangement in summer, under supervision of warden staff. The Nature reserve nearby is always open. 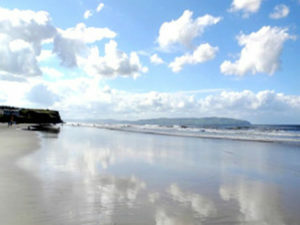 Benone beach is a multiple recipient of the European Blue Flag and Seaside award. It is a seven mile stretch of clean, firm golden sand without rocks, shingle or seaweed which makes it a natural choice for families. There is a stunning backdrop of mountain and cliff scenery and breathtaking views across to Donegal. Within walking distance of the beach is Benone Tourist Complex which has a range of facilities designed to entertain and occupy all members of the family. These include outdoor heated splash pool (seasonal), activities area with bouncy castle, 9 hole par 3 golf course, golf practice range, putting green, tennis courts, outdoor bowls and designated sand dune walks. There is an action packed events programme during July and August. 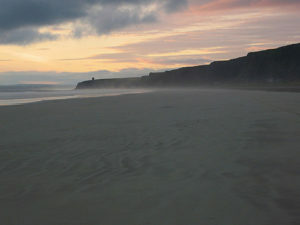 Benone is also a haven for nature lovers as the area is a paradise for the study of botany, entomology and shells. This is a very picturesque seaside village. It has a beautiful sandy beach and is situated on the coast within walking distance of Downhill House and MussendenTemple. A path at the end of the main street, passing a terrace of old stone houses known locally as “the twelve apostles” leads to the Black Glen and onto the Downhill estate and Bishops Glen. No visit to a seaside village is complete without a good cup of coffee and great food. Crusoes Coffee Shop situated on Sea Road above the Village Butcher probably serves the finest coffee in Northern Ireland, if not further afield. A delicious range of homemade cakes is the perfect accompaniment. Periodically, there are cultural events which include a four course meal and concert. Ask in the shop for details. A wonderful way to spend an evening. Castlerock Golf course is situated in a very stunning coastal site within the village with a fine Golf Club to relax in after a good day’s play. 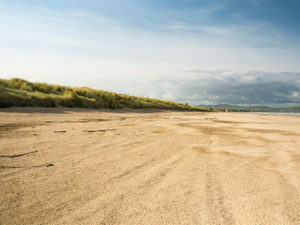 Between Portstewart and the mouth of the River Bann lie the golden sands and domineering sand dunes of Portstewart Strand. It also holds the prestigious Blue Flag award for management, cleanliness and quality of water and is in receipt of theSeasideaward for 2011. 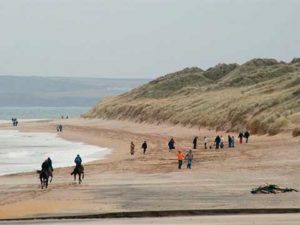 The beach is popular with a wide range of visitors wishing to partake in activities such as surfing, swimming, horse-riding and scenic walks on marked nature trails. Visitors will enjoy the new facilities at the beach comprising new toilets, outdoor showers and improved First Aid facilities. A new beach shop provides everything one needs for a day at the beach, buckets, spades etc. All income generated goes towards the conservation of this special area. 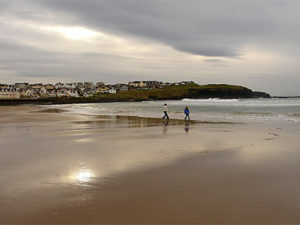 There are three beaches at Portrush, the West Bay and the East Strand stretching to both sides of the small coastal town, as the names suggest. Beyond the East Strand, there is the Whiterocks beach, distinctive because of its white limestone cliffs. Each of these beaches is a Blue Flag holder in 2011 for the management, cleanliness and quality of water. This long sandy beach is close to all amenities of Portrush. As well as being popular with families for picnics and sunbathing, it is also a magnet for water sport enthusiasts. Windsurfing, sailing and canoeing are popular activities. Summer surf schools are keen to enroll new members. Nearby attractions include Barry’s Amusement park the largest theme park inIreland boasting of all the latest indoor and outdoor rides, the scarier the better. This is a firm favorite with the children and is something of an institution for families through the generations, as Barry’s has been operating for over 70 years. The East Strand is very popular and therefore very busy during the summer months. It is backed by glorious sand dunes and the nearby famous Royal Portrush Golf course. It now has a very impressive promenade that sweeps onto the beach, an extension of the walkway that leads from theArcadiaalong the beach towards the East Strand car park. This is an extremely popular location for surfing. Surfers take to the waves throughout the summer and present a very impressive site with their efforts and antics. There are local surf schools which operate, some all year round. The once derelict Arcadia, built in the 1920’s that had a former life as a thriving café and later dance hall until the 1950’s now has a new lease of life following its re-furbishment nearly ten years ago. This majestic white building sits proudly on an outcrop and functions as a beach café during the summer months. There is an enclosed children’s paddling pool at the rear where the little ones can play, whilst the parents can enjoy good coffee and homemade cake.There are often exhibitions of local artists in theArcadiaand a cultural/arts summer programme including yoga, Pilates, tai chi etc.